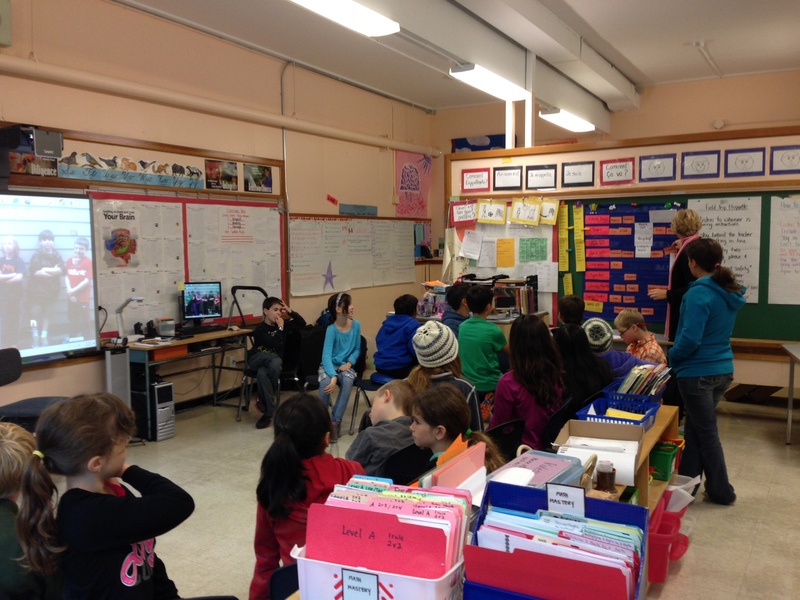 To start my Monday today, I visited James Bay Community School and was blown away by the innovative educational practices. I was so excited with what I saw in so many of the classrooms, that I instantly wanted to call colleagues or run into offices to share. And I did. Then I taught to share it here so that more can see what I saw today. 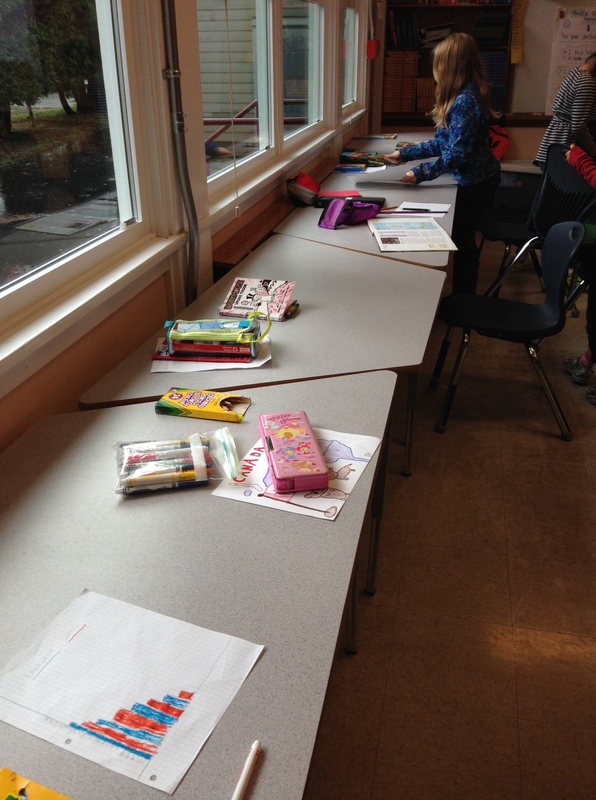 One particular classroom that I will focus on for this entry is that of Ms. Joy Nugent’s Grade 4/5 classroom. The physical layout of the class had no desks. Students had options to work at tables that faced windows, to stand at high table, to sit at bucket chairs, at round tables, or on mats. At the front of the room was a smartboard and document camera, and students would take chairs and form a semi circle for instruction and discussion time. I was only able to observe the first 20 minutes of the day. But the day began with a MindUp exercise where the students were quiet for 5 minutes and focussed on their breathing. It seemed like something they did three times in the day, but wasnt sure. I could tell they had done the excerise before, and some students shared about how they were working their “prefrontal cortext” and how each second of focus was strengthening their brain in that area. There were charts and diagrams on the walls describing the brain and its different areas. As an adult observer, I benefitted from the exercise. 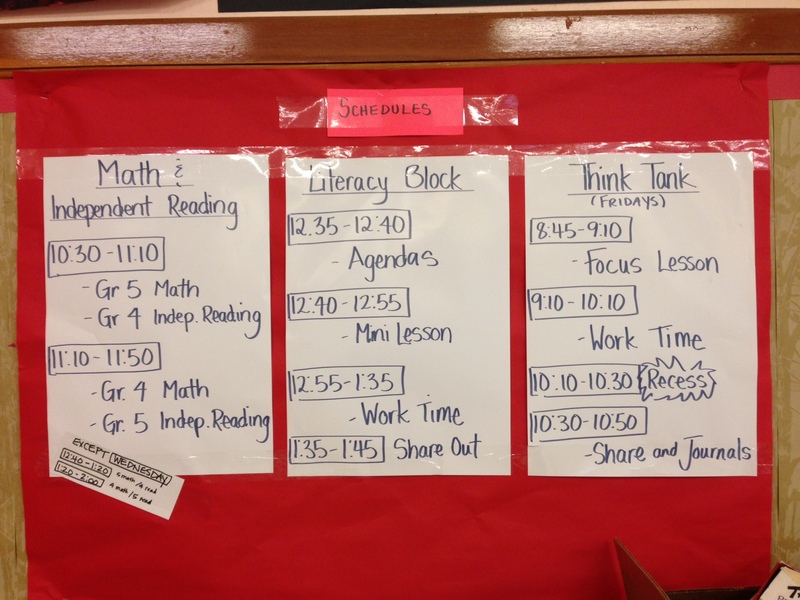 As I walked around the room, I noticed the daily schedule, specifically including “Think Tank Fridays” and “The Inquiry Unit” on Canada. I didn’t have time to ask Ms. Nugent about it, but I felt a certain curiosity and saw Project Based Learning and Inquiry Based Learning characteristics all over it. I couldn’t help notice the incredible student questions that were generated. 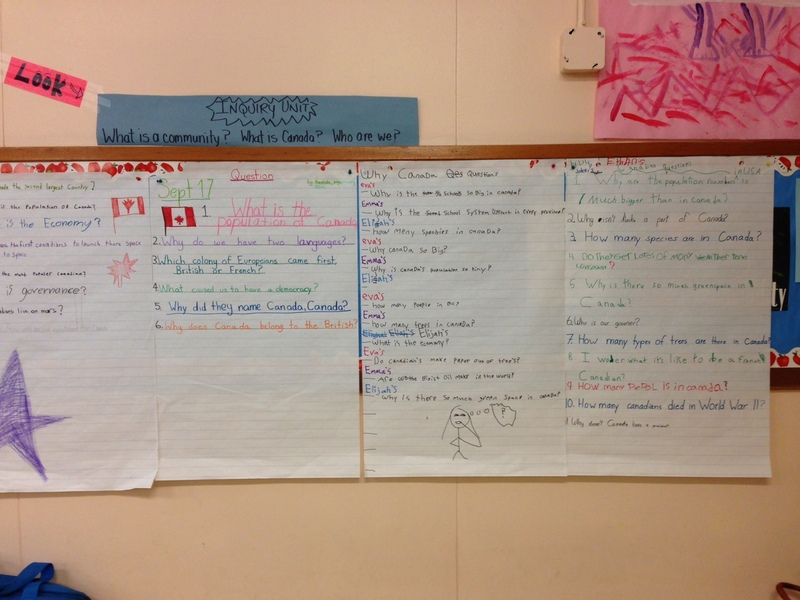 I noticed the heading at the top – “what is community?, What is Canada? and Who are we” that I recognized from BC curriculum. I left thinking about how each question could be a unit in itself – “Why is Alaska not part of Canada?” or “How many Canadians died in World War II”. It caused me to think about how Ms. Nugent structured the class discussion, how the questions were recorded by students, and how the units would move forward. It was fascinating. 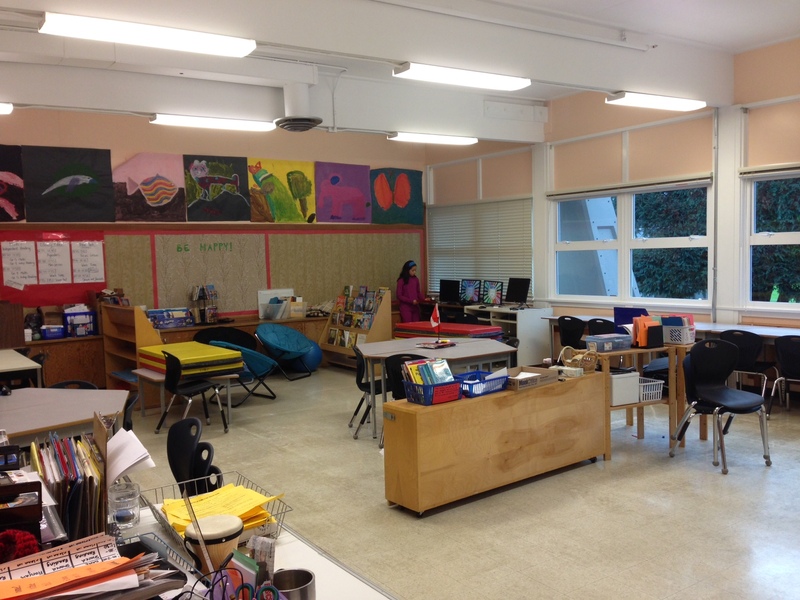 Since seeing this classroom and others at James Bay Community School, my mind was official blown. I left with so many questions. Thanks for the inspiration today Ms. Joy Nugent. I felt proud, and it made me want to shout it from the hilltops. So can I come back? Thanks Dave and Joy! Very inspirational! I got some good ideas from this blog as I am constantly changing my classroom to fit the needs of my students. I wish I had a degree in interior design. Cool post! My own kids went to Braefoot and Reynolds. Wish they’d been part of such a fun and worthy project.